What Everyone Should Know about Anger. Part 3: It is healthy to channel your anger in constructive and productive ways. Anger expressed negatively can devastate a child of any age, but especially when they are tiny. Anger can destroy relationships and ruin things of value. People can hurt others when they get angry but they often hurt themselves. There are times when it is appropriate and productive to get angry. But often getting angry can be dangerous, even embarrassing. It is helpful to know the difference and have the impulse control to carry out the choice. Most important of all is how a person acts when angry. Lesley pulled into her garage after a long hectic day at work. As she got out of her car she heard glass breaking. She went around the corner of her home and saw the shattered living room window. Her son and his friends stood on the street frozen. One of the boys had hit the baseball through the window. Lesley was enraged! Last time it was the neighbor’s bedroom window. She’d told them many times to practice in the school yard nearby. She wanted to scream at them and slap them silly, every one of them! Lesley knew that she was too angry to deal with the boys right then and she told them so. She sent her son to his room and sent his friends home. She changed into her jeans and a T-shirt, went out into the back yard and chopped some wood. As she chopped, her rage dissipated. She was still angry but not enraged. Then she got her son to help her put some plywood over the broken window. Later that evening she and her husband sat down with their son to deal with the problem. Lesley did not blow up, nor did she block her anger. She allowed her muscles to do what they needed to do – attack. But she did not attack her son or his friends, she attacked the wood. She actually destroyed something and created something simultaneously. When people get angry, their bodies pump adrenalin into the bloodstream, preparing their muscles for fight or flight. Their muscles are primed to act and as they do the adrenalin is processed. However, if the anger is blocked then the muscles do not do what they naturally do. The adrenalin stays in the muscles often causing side effects, such as shakiness, until it is eventually processed. Blocked or unexpressed anger builds up over time. The brain and the body need to deal with it in some way. Some people blow up because they can no longer tolerate the tension. Others suppress and repress their anger, which can lead to physical and emotional illnesses. Depression is often the symptom of repressed anger. Neither is healthy and both can cause a lot of harm. It is not very easy to find wood to chop but there are lots of other ways to express anger constructively and productively. What Everyone Should Know about Anger. Part 1: Anger is usually a secondary feeling. Scenario: James watched as his son, a talented goalie, let in a goal that lost the game. Exasperated he let out a cry of disgust. As James and his son walked away from the hockey rink, James berated him for not trying hard enough. His discouraged son emphatically tried to convince him that he had tried as hard as he could – to no avail. Both felt badly. Underlying the anger there is another feeling – a vulnerable feeling – that acts like an engine fueling the anger and driving the behavior. Any vulnerable feeling can fuel anger. Some people get angry when they feel hurt. Some people get angry when they feel threatened. Anyone can get angry when they feel out of control. Some people get angry when they feel pressured. Most people get irritable when they are hungry or tired. There are many vulnerable feelings: abandoned, put down, shamed, embarrassed, exposed, challenged, disappointed, hopeless, controlled, rejected, blocked, misunderstood, and more. In James’ case, underneath his anger was disappointed. When his son did well he felt proud and important, almost as if he’d achieved it himself. He enjoyed the compliments from coaches and other parents. When his son did not do well he felt like a failure. He hated feeling like a failure so he shifted into anger and got on his son’s case. Vulnerable feelings can range from slight to extreme. No one likes to feel vulnerable so most people behave in ways that attempt to avoid or deflect from the feeling. They may get busy talking about something else, they may focus on a task, they may worry about aches or pains they have or they may get angry. Why get angry? When people shift into anger they stop feeling the vulnerable feeling. It does not go away; it just goes into the background. Feeling angry is better than feeling humiliated, rejected or some other vulnerable feeling. When people feel angry they feel powerful, not vulnerable. With anger it may be possible to change what is going on. When people get angry it helps them make happen what they want to happen or to prevent or stop happening what they do not want to happen. James needed his son to do well so that he felt good about himself. He got angry at his son to pressure him into trying harder. Most children feel uncomfortable when their parents are angry so they try to do whatever it is that will stop the anger, whether it is good for them or not. They become more focused on what their parents are feeling than on the activity. That makes it harder for them to do well. What could James do to achieve his goals? First of all, James needs to be aware that he feels disappointed. He probably shifts into anger so quickly that he does not even realize it. Secondly, he needs to realize that his disappointed is about himself, not his son; he is trying to get his needs met vicariously through his son’s efforts and abilities. 1) do things in his own life to achieve a sense of accomplishment and importance. 2) give his son positive feedback about what he is doing well so his son stays focused on the sport. Then his son is more likely to enjoy the activity and perform at his best. Result? Both feel good – his son feel good about himself, James feels good about himself and his parenting. When parents figure out the engine (vulnerable feeling) driving their anger, they have more choices. They may continue to handle situations in the same way or they may find more effective ways, without getting angry, that are positive for everyone concerned. Explore the feelings underlying your anger. What did you feel just before you got angry? What is the purpose of your anger? Is there a better way to achieve it than getting angry? One Reason Why Grandparents Spoil Grandchildren. I was leaning on the car looking at my phone while I waited. My grandson was strapped in his car seat, refusing to get out of the car. He was tired and so was I. I felt very tired. It has already been a busy day. I had agreed to hang out with my 5 ½ year old grandson during the day because it was Spring Break and both his parents were working. I enjoyed doing it. Today was a busier day than usual as my eldest son’s 40th birthday was coming up and his partner had planned a surprise birthday party tonight, which I agreed to host. I picked up my grandson at 10:30 am and on the way to the tennis club I stopped to pick up the Tiramisu cake my daughter-in-law asked me to pick up. My grandson and I went into the bakery. He spotted some cookies that he like the look of and asked for one. No problem. He asked to buy one for his little friend who was going to join us for lunch with his grandmother. He picked out one for him. However, I couldn’t pick up the cake because they said they don’t make Tiramisu cake. After texting my daughter-in-law, she remembered that it was at a different store. We didn’t have time to get it then, so off we went to the tennis club. I usually have a tennis lesson on Fridays from 12:00 – 1:00 pm. So this Friday I shared it with my grandson. He did very well for half an hour even though he got a blister. I had the other half hour. After the lesson we went down to the children’s area and played ping-pong while waiting for our friends. Unfortunately they didn’t come. My friend texted me to say that her grandson had gotten over-tired, had a meltdown and was napping. So my grandson and I had lunch, played some more ping-pong and then headed to my home. I still needed to pick up the cake. On the way I pulled over and parked in front of the store. My grandson refused to get out of the car. I was tired and I knew he was tired, but I could not leave him in the car. I told him I understood that he did not want to go into the store. I told him I didn’t feel like going either, but I needed to get the cake. The birthday party was tonight and if I didn’t get the cake now, I would not be able to get it. He emphatically refused. I did not want to fight with him. I knew if I started to pressure him, he would resist more and things would go from bad to worse. I didn’t want to go there. I was in a bind. I decided I would wait outside the car. 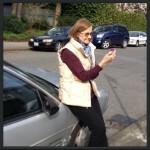 So here I am leaning against the car starting to look at emails on my cell phone. I couldn’t help but think of all I had done for my grandson that day already, yet he was acting up. I knew thinking that way would not lead to a good place for him or for me. It didn’t take long before he cracked open the car door. Relieved, I thought he was ready to co-operate. I open the door more. No such luck. He still continued to say he was not going to go. I told him (all this time I kept my voice in a reasonable straightforward tone) again that I needed to get the cake. He continued to resist. I thought about bribing him with a treat. He’d already had a cookie earlier at the other bakery. It was at this point I thought – this is why grandparents spoil their grandchildren – they don’t want to fight with them. I certainly did not want to fight with him. While I think there are times that bribing children is warranted, I did not want to bribe him either. I love him too much to do that to him. We happily went into the store. I found the cake and got into the line up. I remembered that I needed bananas so I asked him if he would go get me some. He willingly did this, going by himself, picking out a bunch of bananas and joining me at the checkout. Soon we were home at my place. We were good with each other. I felt good about how I handled the situation. I did not yell at him, coerce him, call him names, complain about his behavior, bribe him, threaten him or fight with him. I did not give in to him. If I had, I knew I would feel resentful and that would not be good for our relationship. The time it took to wait (less than a minute) was much shorter and easier than if I’d gotten into a battle with him. It also strengthened our regard for each other. The focus of the situation remained -I needed to do a task. It did not evolve into an issue of who was boss and who had bratty behavior. When children and adults are tired, behavior can often dissolve into power struggles. Waiting calmly sometimes can avoid these struggles and take shorter time and less energy than fighting. Relationships are enhanced rather than damaged.